Ohio-Erie Canal – Let's Go RVing! Seeing our country one state at a time! As usual for us we got a late start trying to decide whether to chance the impending rain. We finally decided to go into Roscoe Village which is basically a historic village with a lot of little shops, the general store, a candy shop, a leather shop, etc. Our first stop was the Visitor’s Center which housed some memorabilia from days past plus we watched a video detailing how Roscoe Village became a canal town. Originally Ohio was virtually cut off from the major cities because of the rugged terrain until the canal system was instituted in the 1800’s. Along with other towns along the canals it began to flourish until the railway came along. 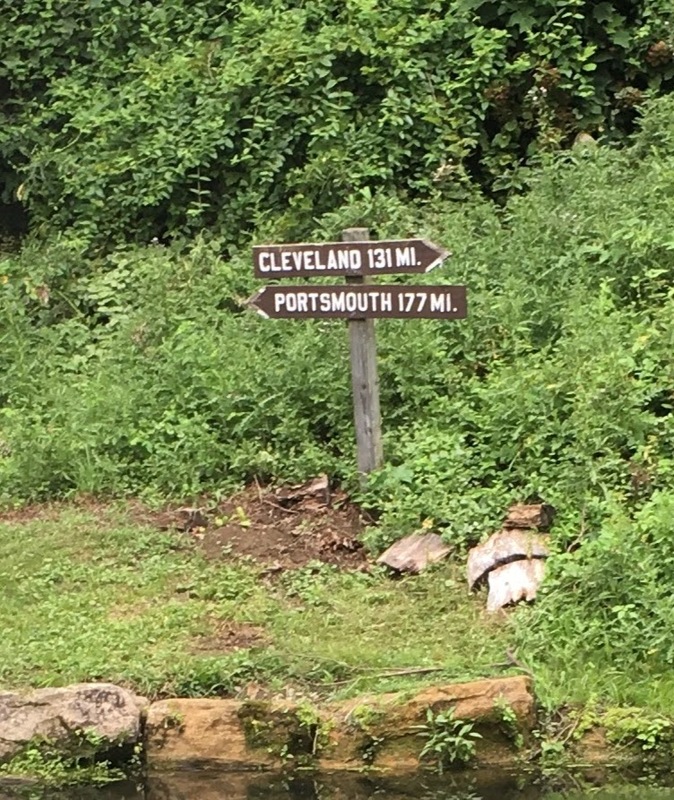 Then the trip from Portsmouth to Cleveland which had taken about 8 days (and only day travel) on the canal could be accomplished in a much shorter time and more comfort as well thus the beginning of the demise of the canals. We wandered around a bit and then decided to follow the advice of a fellow camper and have lunch at the Warehouse. Both Jerry and I had heard about the onion rings so along with his burger and my grill cheese we got a half order of rings. I can’t imagine what a whole order would be like because the half order was more than we could eat. The were delicious, served with a sauce that was reminiscent of a blooming onion from Chilli’s. After lunch we wandered around a bit more looking for the usual magnet and we finally found one. Lots of t-shirts, hats, mugs, but no magnets until we finally found one in a dress shop. Go figure! Our next stop was the horse drawn canal boat ride. 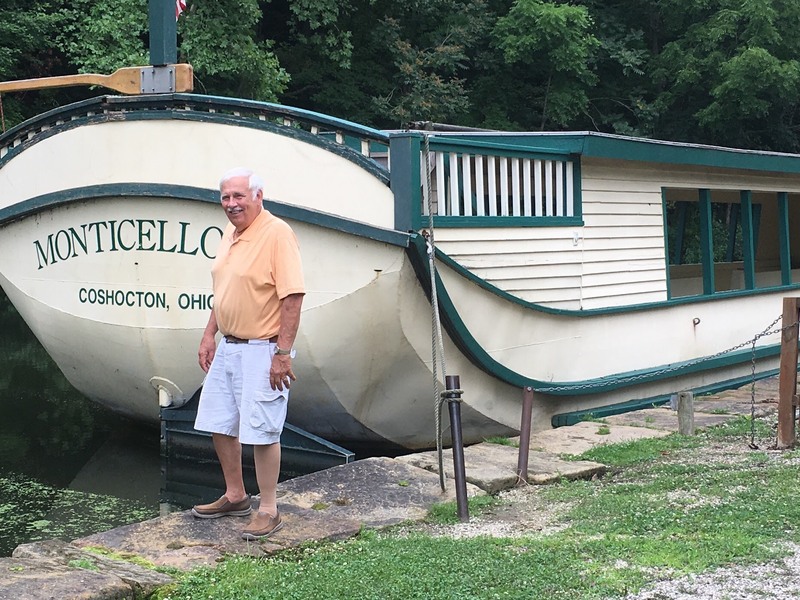 The boat was the Monticello III and we floated down a restored section of the Ohio-Erie Canal. It was an interesting 45 minute ride but toward the end the mosquitoes got pretty bad. The men who dug the canal were Irish and German immigrants and were paid $.30 a day and they worked from sunup to sundown seven days a week. What a difficult life. Many died, many from malaria. The horses were steered by young boys 12-14 years old and they often had cuts on their feet from the jagged rocky ground and many of them died also. 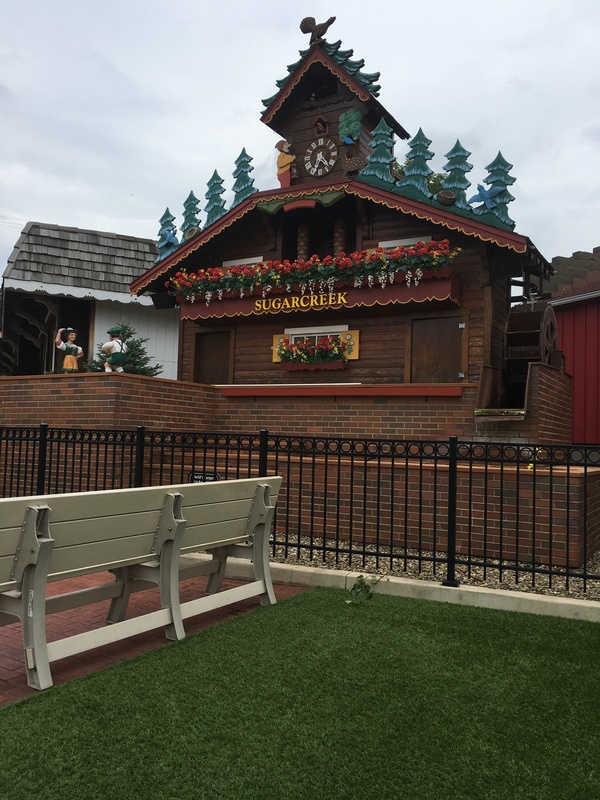 When we left the canal ride we decided to ride over to the Village of Sugarcreek. It’s a Swiss Village but upon reading about it I felt that it was probably just a little town with nothing of significance to entice us to ride over. Jerry said either that or go back to the coach and read. We elected to go to Sugarcreek. We had been told that this area had a lot more Amish than where we were in Indiana but I had not seen any until our ride to Sugarcreek. We got behind several buggies in the hilly roads and had to follow them for a while until we could pass them. That proved to be a bit challenging at times due to their slow speed and our inability to see around them. We made it to Sugarcreek and it was closed! Seriously, not a store was opened but we did notice what we later realized was labeled as the Largest Cuckoo Clock in the World. We were lucky enough to be there when it chimed at 4:30. What a show! A three-foot-tall couple on tracks danced the polka to Bavarian music played by a five-piece robot oompa band and that occurs every 30 minutes! It made the drive over well worth it. From what I’ve read Sugarcreek has a lot more to offer, just not on a Sunday. We took a different route back to the campground – isn’t GPS great – you never know where it will take you but apparently the Amish were using the same route because we continued to see them driving along. Since we had such a nice lunch we chose not to have a big dinner so just enjoyed our quiet evening. Planning an RV Trip – With No RV! On to the Gator Bowl – Again!